This gorgeous property was owned by two UW Physicians with 3 children, all train aficionados. The doctors purchased the Sunny Jim Peanut Butter Company Caboose and moved it to Pirates Cove, train tracks and all! They rebuilt the caboose from the floorboards up, extending the width 2.5 times to allow room for a queen bed, 2 person shower, full kitchen, W/D, gas fireplace and expansive water views from the large Picture windows in every room. The leather sofa looking at the water converts into a very comfy, curved wood slat, queen sofa sleeper. Their remodel makes the caboose infinitely more livable while maintaining the charm and nostalgia of the caboose, delighting adults and children alike. The property and the views are simply unmatched. Catharine merged her graphic design business with Phil's video production, editing, duplication business in Seattle in 1995. In 1999 they purchased "A River Runs Through It Cabin" at Stevens Pass as their own personal getaway. Catharine's business involved creating websites for corporate clients such as Weyerhaueser and Paccar. She purchased Greatgetaways.com domain and launched the vacation cabin rental business. An immediate hit, the couple added cabins at Index and Puget sound that same year. In 2002 they added Copper Creek Inn, Cabins and Lodge Resort at Mt. Rainier to create the perfect triangle of Western Washington Mountains and Sound Cabins. Catharine and Phil purchased Copper Creek Inn, Cabins and Lodge property at Mt Rainier in 2002, opening their first remodeled cabins there in 2006. Our guests nominated and voted Greatgetaways.com and Copper Creek Inn #1 two years in a row in King5 TV's Evening Magazine competition. Catharine uses her artistic sensibility in every aspect, from website to furnishings and fixtures, landscaping for guest privacy, taking every effort to provide every amenity while maintaining a close relationship with the beautiful natural settings surrounding our properties. Unmatched Views. Private Beach. Kayaks. 3 forested waterfront acres. The caboose advertised for 5 years on our primary website, greatgetaways.com. When the owners, 2 doctors from the University of Washington, told us it was for sale, we thought only a moment before purchasing the beautiful property. The doctors 3 children, like their parents, are train aficionados. They purchased the Sunny Jim Company caboose, moved it, tracks and all, to Pirates Cove, remodeling the caboose from the ground up..expanding the width 2.5 times. The remodel included a queen bedroom complementing the 4 bunks, a 2 person shower, living room, full kitchen, fireplace, picture windows looking right at the water and a washer dryer. A very comfy vacation home with thrilling Puget Sound views. Our hearts still beat fast when we pull into the driveway and see the water. Peace, Quiet, Private Beach, 2 kayaks, Washer Dryer, flat screen DVD system with HDMI inputs WiFi, Gas fireplace, 3 waterfront acres with forest, Everything you need is present. All you need to bring is your own good spirits, food and beverages. Quoting the guestbook, "We stayed 13 nights and it was not long enough." Hammersly Inlet is one of Puget Sounds inland ocean waterways. You are on the beach. 3 quiet, private wooded acres enhance the water views. The Caboose is off Hwy 3, 22 miles S. of Belfair, 10 minutes N. of Shelton. Take Agate to Old Farm Rd. to Pirates Creek Rd. Kayak E toward Hope Island. About ten minutes into your trip you will round a bend and Mt. Rainier will appear ahead of you down the sound. Hammersley Inlet is a narrow inlet, home to all forms of sea life, seals, occasional Orcas, Eagles, Herons, gulls. Hammersley inlet is on Puget Sound, Washington States inland ocean. Suntan, Dig clams, fish from beach or two kayaks included with your rental. Water ski in, boat in, jet ski in. Water ski out, boat out, jet ski out. You will never tire of the views. "We stayed 13 days and it was not long enough". From the guestbook. 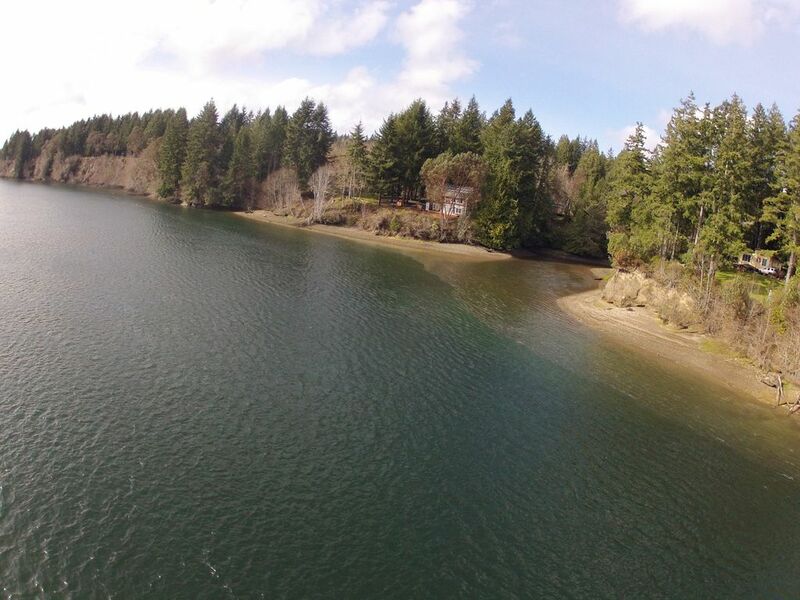 3 private waterfront acres--unheard of. Most waterfront properties are 100 feet lots with neighbors everywhere. You will love the quiet beauty, the unmatched forest completing the extraordinary views. Verizon cell for sure..no report of trouble with the others..att..etc. Set your phone to internet calling if you have reception issues. Beautiful views of the water from the living room picture windows. Full Kitchen with view of the forest and water while dining. Dine in or outside..waterfront dining at its best. Flat Screen DVD/ROKU Netflix system..good DVD's in the room..plug your laptop HDMI cable into HDMI connection. 6 person hot tub in covana gazebo looking right at puget sound! EV's enjoy Nema 14-50 charge free to guests for Tesla and compatible EV's. Pirates Cove Caboose is unlike any other Caboose lodging. The original owners were Doctors at UW Medical Center with 3 children, all with a passion for trains. They purchased the Sunny Jim Company Caboose and moved it, track and all, to this beautiful Waterfront property. The completely remodeled it to maintain the charm of the original caboose while extending its width 2.5 times to allow room for a queen bed, 2 person shower, full Kitchen, living room, fireplace and Washer Dryer. Perfect for couples and families. Quote's from the guestbooks, "We stayed 13 nights and it was not long enough". Aye Matie..We saw 3 Orca's from the hot Tub!" Great place! So private and peaceful as well as comfortable! We will be coming back! Thank you for staying with us! Welcome Back to Pirates Cove Caboose! We stayed 4 nights and this is a nice property and we enjoyed our stay. There are a few details missing from the provided information however. There is no air conditioning. There are also houses around including a house right next door - very friendly neighbors but close enough that we interacted with them many times. It was fine but not exactly the privacy I thought I was paying for. There is also an extremely steep/difficult staircase you must go up/down to access the beach which is not mentioned or pictured. I'm very thankful we decided not to bring my older dog because he would not have been able to access the beach area. It was nice, clean, peaceful.. no complaints but I probably wouldn't have paid as much as I did had I known about the lack of AC and it not being super private. This property was absolutely fantastic. You have acces to a beach with lots to discover, a hot tub with a breathtaking view, and the novelty of sleeping in a train. We had a wonderful three-night stay, and our only regret is that we didn’t stay longer. We loved staying here! It is such a beautiful property. The views and the water access were awesome. We had some hiccups with the kayaks, but when we contacted them everyone was very responsive and did everything they could. A walk on the beach, some swimming and kayaking, s’mores at the fire pit, relaxing in the hot tub, and a comfortable bed to fall asleep in made wonderful days of our vacation. It is a very unique property, but plenty big for five and well stocked for a wonderful home away from home. We highly recommend! My children and I had a fantastic time at Pirates Cove. The waterfront was fantastic and the kids safely played each day for hours, catching crabs and wading in the water. We enjoyed the quiet and the views from both the cabin and the fire pit area. The kitchen had everything I needed to prepare meals and the larger bed is amazingly comfortable. The kids felt comfortable wandering around on their own and they explored nature. And to end each evening in the hot tub as the sun faded.... We are already planning on heading back for another mini vacation. We are thrilled you and your children loved Pirates Cove Caboose. We welcome you back! Lots of Fun at the Caboose! There is no shortage of fun things to do at the Caboose, between hunting for oysters/clams, doing beach walks and kayaking. It is a beautiful location and we enjoyed some gorgeous sunsets every day. Top that off with the hot tub, campfires and an adorable Caboose and you can't go wrong. Thoroughly enjoyed our 3-night stay- we could've stayed longer! Highly recommended and appreciate the hosts very much. So glad you loved The Caboose as we do. Thank you for your wonderful comments! Home to year around festivals, great restaurants, parks, natural beauty of Puget Sound. Perfect location for touring..Hwy 3 destinations..Hood Canal, Allyn, Belfair, Alderbrook, Port Orchard, Silverdale, Bremerton, Paulsbo, Port Townsend, Olympic National Park Hurricane Ridge, Port Angeles, Seattle, Washington Coast, all within an hour and one half from Pirates Cove Beach House. Quote from our guestbooks.."We stayed 13 days and it wasn't long enough". Cancellations made between time reservation is made and 15 days prior to your arrival, we offer full credit toward another visit or a 75% refund. Cancellations 0 to 14 days prior to your reservation, we are unable to offer refunds or credits unless we are able to rebook the dates you reserved. If we are able to re book the dates, we offer full credit toward another date or a 75% refund. The Caboose shares Pirates Cove with Pirates Cove Beach House to the west. Listing # 4005983. You may rent both and walk between them at low tide, meaning Pirates Cove is perfect for large family gatherings, reunions, Birthday parties and weddings up to 30 people. Perfect for couples and families. Both the beach house and caboose are pet friendly.